Using Dominoes to Build Number Understanding, materials and actives. 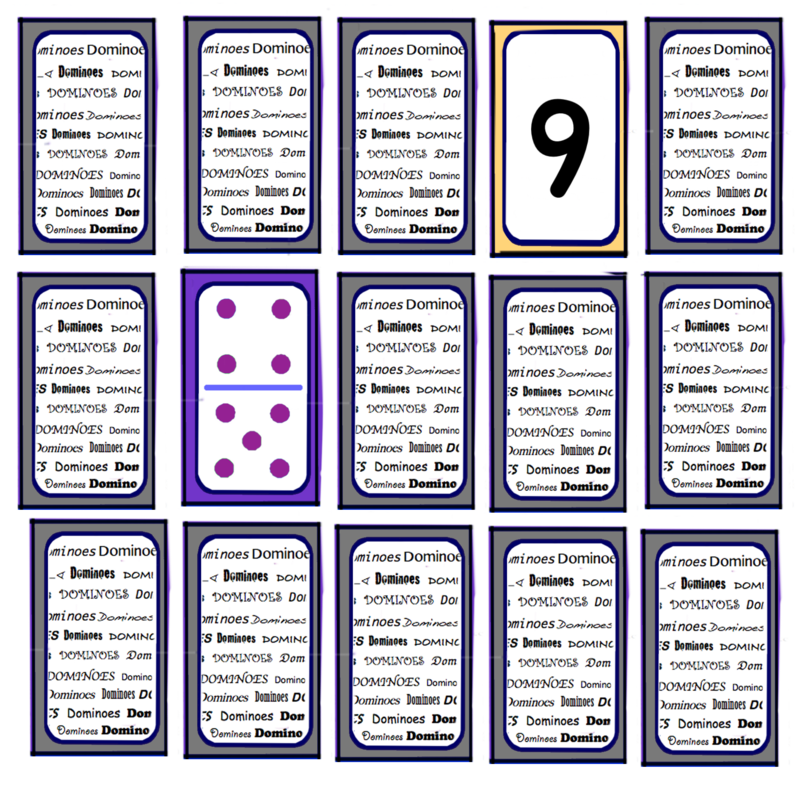 One way, to help students visualize numbers, is to use a set of cards similar to dominoes. In this method we will focus on the numbers $1-5$. 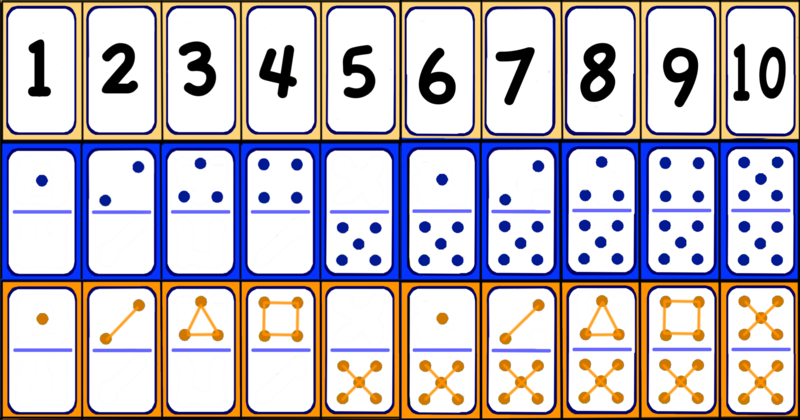 The idea of the dominoes is to help the student think of larger numbers as a sum of 5 and n. Eight can be though of as $5+3$ and seven as $5+2$. This can help the student with learning adding math facts. 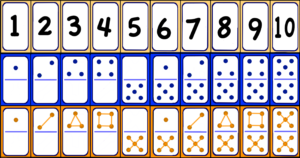 Under “Notes” (on the left) are five different colors of dominoes, one set of cards with the shapes, two different ways you could represent each domino as numbers, and a page to put on the back of the domino cards. 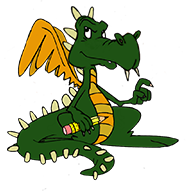 Print the cards you want to use on card stock or thick paper. On the backside of the sheet print the last page (the one with all the words) — this is to help make the cards harder to read from the back. 1. Put two sets of dominoes upside down on the table. They then draw the domino using the shapes (dot for 1, line for 2, triangle for 3, box for 4, and an X foe 5.) Next they write what number is being represented. When they do a number for a second time, they can stack the pairs. Variation as a game: The players alternate picking tiles, and the one with the most pairs wins. Place a set of dominoes and the set of numbers face down on the table. Have the player turn over two cards. If they match they keep the cards, if not they flip them over again and try again. 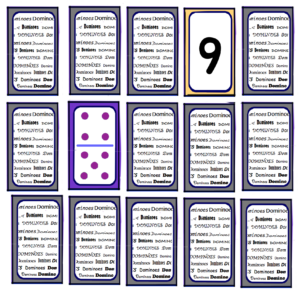 When listening to a talk about how to help students who struggle with learning their adding fact, the teacher described using cards very similar the domino cards used here. Unfortunately, I did not write down the name of the person who developed the idea she was presenting. If you happen to know who it was, please contact me so I can give proper credit.